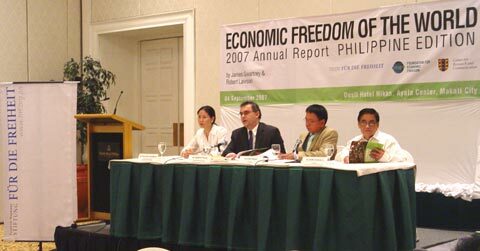 To contribute to the informed economic debate in the Philippines, the Friedrich Naumann Foundation (FNF) together with the Foundation for Economic Freedom (FEF) and the Center for Research and Communication (CRC) launched the first Philippine edition of the Economic Freedom of World (EFW) 2007 report to business leaders, policy-makers and members of civil society and the academe on 4 September 2007 in Makati City. Dr. Emilio Antonio Jr., president of CRC, opened the launch by stating that the Economic Freedom Index is constructed to give data on “what economic freedom means, how a country measures up to such definition, how it compares to other countries, how it is proceeding through time and what can be done to improve the current situation.” FEF President Alex Magno, on the other hand, spoke on the downward slide of the Philippines after 1992 from number 26 among all economies measured by the Index, to 69 in the latest report. He joked that this slip shows that FEF has not been doing its job well, although the launch is part of its effort to educate the public and the government. “There is much to learn from the mass of information in the Index that will help reduce the volume of economic superstition that continues to bedevil Filipino public opinion and policy-making,” Magno said. “The real strength of the EFW report is its academic rigor,” said FNF Resident Representative Siegfried Herzog. “It’s an empirical test to show that the economic freedom desired by liberals does indeed correspond to better development outcomes,” he said. 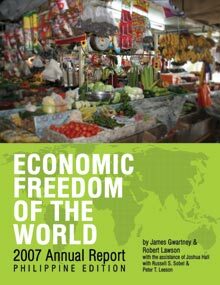 The EFW is an annual report that discusses the degree of economic freedom around the world based on a composite Index that includes: size of government, legal structure and security of property rights, access to sound money, freedom to trade internationally and regulation of credit, labor and business in 141 nations. The report also compares economic freedom and other desirable outcomes, such as prosperity or quality of life, as measured by the UNDP Human Development report. It finds a strong correlation between economic freedom and various important developmental goals. The Index has become an important tool to evaluate economic policy worldwide. It has been replicated in several federally structured countries to compare the economic freedom and developmental performance of different provinces (China, Canada) or states (US, India and Germany), with similar results: Economic freedom delivers the goods. 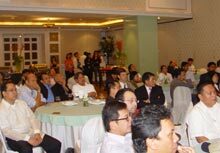 To read Dr. Antonio’s remarks and to view Professor Magno’s presentation, please click here. Please e-mail your name and address to liberal@philippines.fnst.org if you wish to receive a free copy of the EFW report.